Residential air leaks may sometimes go unnoticed as you set your heating system higher. While air leaks are often hard to find, the task can easily be accomplished using testing tools. You may run the tests yourself or better yet, hire an expert to do the task for you. During winter, it is easy to know whether your home is leaking warm air or not. Place your hand on these spots for possible leaks of cold air. Windows – If there’s a slight gap between the frames and glass panes of the windows, surely there is air leakage. Exterior Doors – Once you feel the outdoor air on your backdoor or in the living room, it means that the seal in the doors is not tight enough. Air Vents – Vents that are not properly closed indicate air leaks. Fans – Faulty fan systems are a possible source of leakage. Before getting started, shut off the HVAC system and all alternative wind sources in the house. Light the incense then walk around specific areas at home. 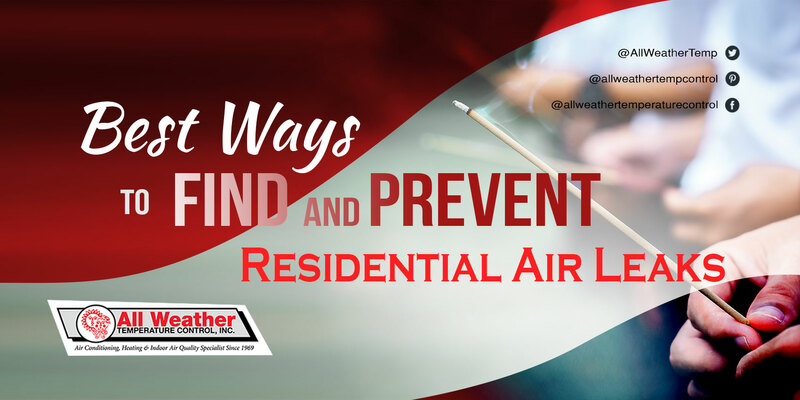 You will identify an air leakage if the smoke from the incense blows parallel in one direction or another or when the smoke draws toward the window or door. Light the candle and walk around the house with suspected air leaks such as light fixtures, windows, and exterior doors. Place the candle in front of the seals then observe the flame. A shaky or wobbly flame means there’s a flow of air coming from the outside. For more accurate results, you may need to invest in a leak detector. Hold the detector and walk around the interior parts of the house where leaks possibly exist. This device changes its light after detecting a leak: blue (for cold air leak) and red (for hot air leak). No leak is present when the light stays white. Detecting leaks in your house is easy with these do-it-yourself efforts. But, they do not guarantee 100% accurate results. For guaranteed leak detection, turn to the experts at All Weather Temperature Control Inc. Using advanced tools and professional strategies; we can identify air leaks fast and in real-time. Contact us for expert leak detection now!